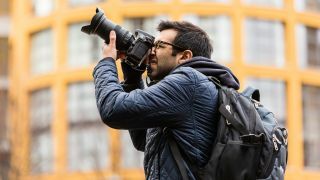 Modern camera metering systems have great general-purpose modes, often called Evaluative, Matrix or Multi-area depending which camera brand you shoot with. These do a great job of assessing a scene and setting good 'average' exposure settings in many situations. However, they're not 100% foolproof and very dark or very light scenes, or backlighting can trick them into over or underexposure. They're also not psychic and don't know what you're seeing in your head when you take a shot. Switching to spot metering puts you in control of where the camera meters from and helps you develop a much better understanding of the tonal range in a scene. A standard spot metering system allows you to meter from a very small part of the scene and it suggests exposure settings that will render your target a mid-tone. Consequently, you need to take care with the positioning of this spot, study the scene carefully and decide which is the best area to take a reading from. It's often helpful to combine spot metering with AE Lock as this will fix the exposure settings (after metering) while you compose the image. Just like the Levels display in image editing software packages such as Adobe Photoshop, a camera's histogram display is a graph that represents the brightness of the pixels that make up an image. The scale runs from black, with a brightness reading of 0, on the left to white, with a brightness reading of 255, on the right. The peaks in the histogram indicate the number of pixels with that brightness and a large peak means lots of pixels have that brightness. This means that a very dark image will have peaks over to the left of the graph, while a bright one has peaks on the right. Meanwhile, a correctly exposed 'ideal' scene has a histogram with a so-called 'normal' distribution with a peak in the middle and just a few very bright and very dark pixels. Checking the histogram after every shot will increase your understanding of the brightness distribution of an image. It will also enable you to determine whether an image is under- or over-exposed with the majority of pixels being grouped to the left or right of the graph respectively. Using a prime, or fixed focal length, lens enables you to forget about the distraction of zooming in and out. Instead you walk towards or away from a subject, assessing it through the viewfinder and then either shoot or move again to find a new or alternative vantage point. It forces you to explore the subject more fully and you'll soon get a better understanding of the angle of view of the lens. As well as letting you travel light, if you take just one lens with you on a shoot, or day out with your camera, you'll really get to know that focal length and in the future you'll be able to decide which lens to mount on your camera just by looking at the scene and framing an image in your mind. Modern automatic white balance systems are extremely capable, but that's not always a good thing because it can mean that you shoot with your mind in neutral (ha!) as far as colour goes. This may be fine much of the time, but if the camera delivers a result that you don't like, you may find yourself a little stuck for answers. The answer is to climb free of the auto white balance safety-net and set a preset white balance value for the appropriate lighting conditions. You may find that the Daylight or Sunny white balance setting produces the best results for the majority of the time when you're outside, but it's worth experimenting with the others to assess their impact in a range of conditions so that you know when to use them in the future. Don't be afraid to use the wrong white balance either - you can get some incredibly cool results if you use a tungsten setting in daylight, creating images with a really cold, chilly atmosphere. It's easy to set the custom white balance value of a camera, you just set it to the correct mode (the manual will explain how to find this) and then photograph a white or neutral grey card in the same light as your subject. Well that's the theory. In practice it can be little trickier, because the angle at which you hold the card can have a huge impact upon the final result. If the main light is coming from directly above your subject, for example, and you tip the card slightly downwards towards a colored area under your subject you will find the result is very different to the one you get if you hold the card slightly tipped upwards. Learn how to make a custom white balance setting with your camera and experiment by holding a white balance card at different angles to see for yourself and learn. If you find you don't like the neutral look of images that your camera produces in this mode, try the adjustment controls until you find a setting that works for you. Although aperture and shutter priority exposure modes are very useful, they leave the decision about how bright or dark the image will appear to the camera. Manual exposure mode puts you in charge and it forces you to think about the brightness of a subject and its surroundings. It also means that you have to consider both depth of field and freezing or blurring movement. It can be helpful to combine this exercise with using spot metering as it will enable you set select exposure settings that work for a specific part of the scene. Rather that shooting in a sporadic fashion and posting images to Facebook, Twitter, Flickr, Instagram or any other social networking or image sharing site as and when you feel like it, try committing to shooting at least one image and posting only one shot every day. This will encourage your powers of creativity, helping you to find novel subjects and explore new areas or genres of photography. It will also mean that you have to critically assess each image to identify the best shot from that day to post. Wherever you post your image, make it known what you are doing as this will underline your commitment. It's also often a good idea to request constructive criticism to help you see your shots from another viewpoint and improve as a photographer.